As Amazon prepares to build its new HQ in Long Island City, let’s all take a deep breath and remind ourselves: New Yorkers don’t need Amazon at all. Since November, when New York was picked as the "winner" of a months-long tax-cut bidding war for Amazon's new headquarters, New Yorkers have been dreading what Bezos’ behemoth will do to our city -- like crowd our already-crowded trains, jack up our already-jacked-up real estate prices, and bring even more tech bros in Patagonia vests to our shores. Even if every single New Yorker stopped shopping on Amazon, we still couldn't save Long Island City. But at least here, unlike some commercially underserved parts of the country, we can thumb our noses at Amazon by shopping local. With retail conveniences like bodegas, courier services, and big-box mom-and-pop-shop Jack’s 99¢ store -- the IRL answer to Amazon’s brand-ambiguous, endless assortment of cheap and sometimes sketchy products -- we’ve got everything we could ever order online no further than a subway ride away. If Amazon were to erect the kind of pop-up experience that has become ubiquitous on the retail landscape, it would conjure an exact replica of Jack’s. Your local corner store is likely your first-aid kit, occasional kitchen, and sometime secret keeper. But if Amazon were to erect the kind of pop-up experience that has become ubiquitous on the retail landscape, it would conjure an exact physical replica of Jack’s. Need-it-now New Yorkers have been snapping up discounted products from Jack’s since 1991, when a “portable” Macintosh computer weighed six pounds and Amazon Prime was just a twinkle in Jeff Bezos’s eye. 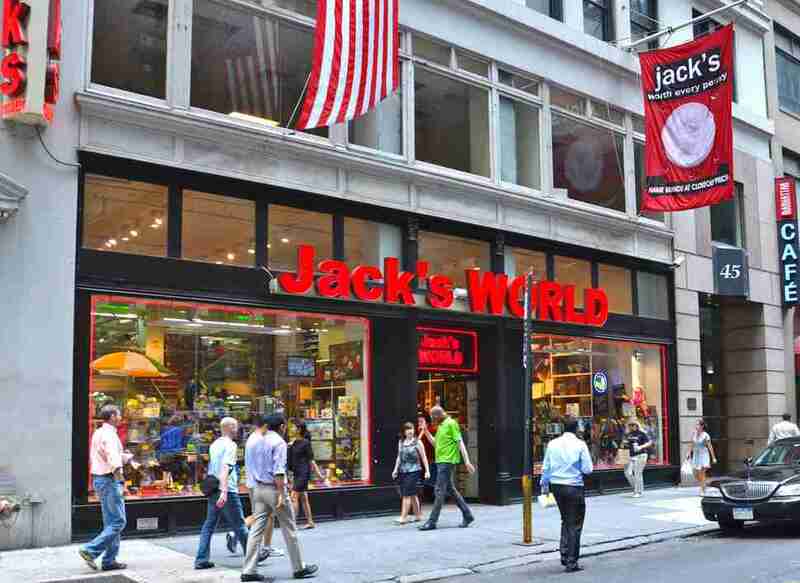 Although countless mom-and-pop groceries, bookstores, and department stores have been elbowed out of the city by Amazon’s prices and two-day shipping, Jack’s three Midtown locations have managed to stay open. In fact, on a recent Saturday afternoon, the flagship store on 32nd between Sixth and Seventh is packed full of Christmas shoppers in their corporeal forms. 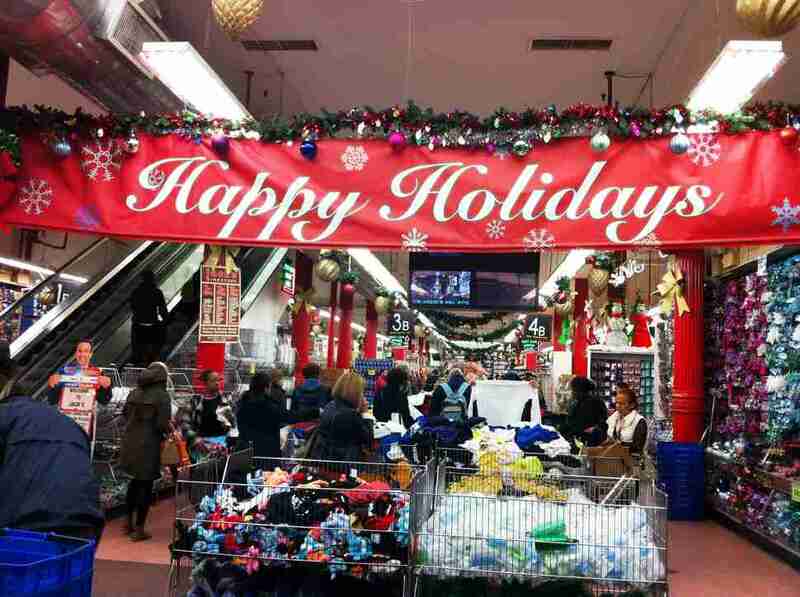 It’s December 1, and the store’s entrance is decked in the Made in China holiday spirit: novelty-sized candy canes; Frozen stockings; red and green sweatpants; ornaments in the shape of tiny high heels with strings of rhinestone-securing hot glue clearly visible. Lindsay Sullivan, 22, and her roommates are in the Christmas section on an emergency shopping mission. The party they’ve planned for tonight has been nearly spoiled by a late Amazon delivery. Like other dollar stores, Jack’s makes its money on an indiscriminate and ever-changing assortment of discontinued, overstocked, or underperforming items. They buy in bulk, at deep discounts, and sell the product quickly to Midtown crowds. Not everything at Jack’s costs 99¢ (a nine-piece nativity scene is going for $7.99), but items are priced to move. The department store setup includes groceries, apparel, housewares, beauty, souvenirs, and party supplies. Jack’s has all the whosits and whatsits and household supplies you’d order from Amazon. A small army of minimum-wage associates criss-cross the store with big red carts to restock the shelves as quickly as they’re emptied. When you search “mug” on Amazon, the algorithm offers up an approved assortment of sponsored and SEO-optimized results. Add “Asmwo Color Changing Heat Sensitive Magic Funny Art Mug Large Coffee Tea Plum Blossom Porcelain Mugs for Women Mom grandma Gifts 16oz Black Change Glow Red Cups” to Cart? It’s $14.99, and Prime members can have it delivered by tomorrow if they order by 2pm. But if you buy a mug at Jack’s, you can have it today, for 99¢. While you’re there, you can also find things you didn’t even know you needed. The physical space allows you to browse, touch, smell, laugh at a truly heinous painting of a woman and a lion, decide if you want to swing the 99¢ for lime lip balm or microfiber cloths or Nag Champa-scented incense. One thing that never changes? New Yorkers’ need to have everything close, cheap, and now. Amazon can beta-test all the drones they like (actually, please don’t), but they’ll have to pry bodegas and corner stores from our cold, dead, crippled-by-swipe-induced-arthritis fingers. That light and sweet coffee just wouldn’t be the same if it was brought to you by the dark machinations of Bezos instead of the deli guy who knows your dog’s name and how much you like Flamin’ Hot Cheetos. 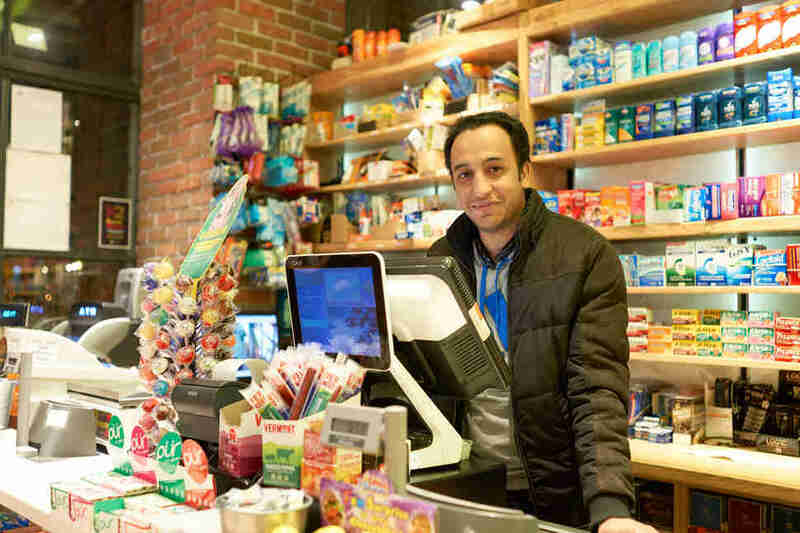 Although data from Proper Insights & Analytics shows that 43% of US consumers now have a Prime membership (up from 20% in 2013), Amazon just can’t seem to get us to give up our bodegas. According to NACS, the number of convenience stores nationwide rose 0.3% in 2018, continuing the growth that’s been trending since 2010. 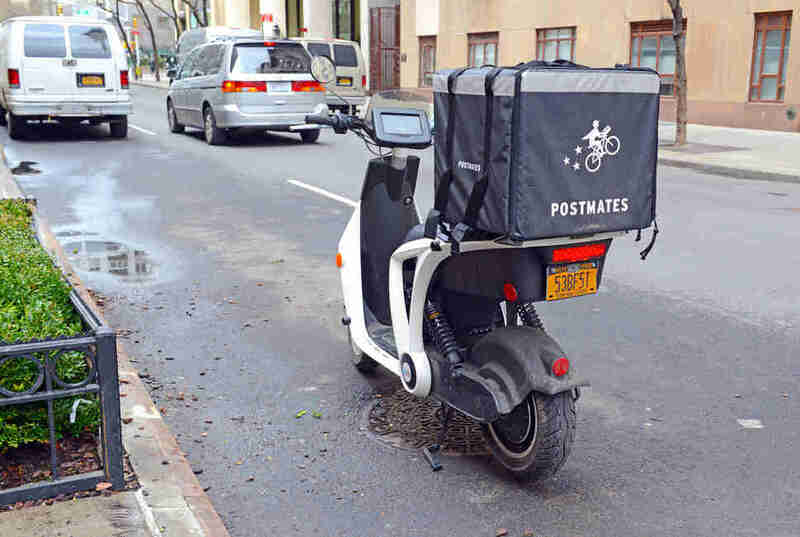 If you still can’t bear to speak to a stranger or have someone see you in your sweatpants, you can always use one of the many delivery services that let you shop local from the glowing comfort of your phone. On the other hand, leaving your house to pick up some toilet paper really isn’t that bad, in the grand scheme of 2018. You might have to talk to someone, but that might even feel... good. Sure, putting on pants and walking a block is a little less convenient than pressing the Amazon Prime Charmin Dash button you keep next to your toilet. But is pressing your toilet button really worth your humanity, or New York’s? Maybe optimizing convenience to its absolute limit isn’t the path to happiness, after all. 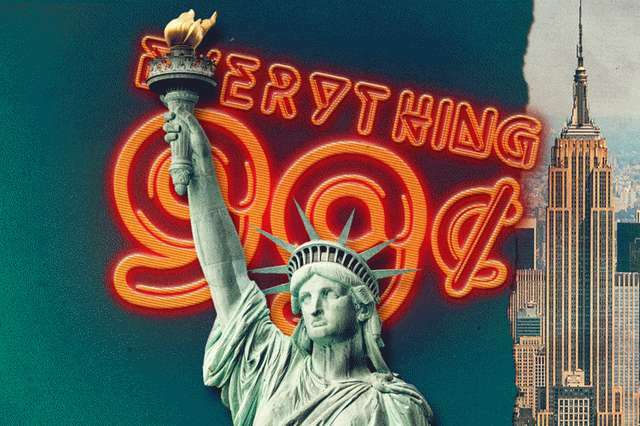 As Jeff Bezos readies his helicopter to land in the LIC helipad New Yorkers are paying for with his 1.5 billion tax break, remember that New York already has everything you could ever want and need -- and even some stuff you don’t. Maybe optimizing convenience to its absolute limit isn’t the path to happiness, after all. When asked whether New Yorkers need Amazon Prime, an Amazon spokesperson referred to the 2018 “Best of Prime” press release, which boasts that one of the fastest Amazon Prime deliveries was in Seattle, Washington; a bottle of pinot noir in nine minutes. As in, more time than it takes to get to your local liquor store and back. So consider this: Delete your account. Take a refreshing swig of some Indonesian Listerine. Step away from your computer and into the world. Allow yourself to be surprised by what you find.